A week later, I have had time to look back over the Robin Hood Half Marathon, and reflect on the recording from my watch and heart rate monitor. I had pressed the event marker button at 1, 4,7 and 10 miles so I had estimates of my pace and heart rate in each three mile segment after the initial mile. As expected from the effort I put into the final few Km, my fastest segment was from 10 miles to 13.1. However despite a substantial increase in effort, my pace of 4:46 min/Km in that final 3.1 miles was only marginally higher than the average of 4:51 for the entire event. I expended a lot of effort for a modest gain in speed. Despite the effort, my heart rate only rose moderately, to an average of 138 over the final 3.1 miles compared with 133 for the entire event. Thus, the cardiac cost was 659 beats/Km in the final 5 Km compared to an average of 646 for the whole event. This reflects a small loss of efficiency, but that is not too bad, as efficiency usually decreases when one is tired (and heart rate also rises as body temperature rises). However the noteworthy point is that despite trying to recruit every available leg muscle fibre, my heart rate was still substantially lower than I would expect for the final stages of a race. It appears that I just do not have the muscle power to maximise the use of my cardiac output at present. My struggle to recruit my leg muscles is also clear in the photos. At halfway, my hams and calf muscles were quite tight but I was fairly confident that they would get me to the finish, so I decided it was time to increase the effort. By about 12 Km, the effort shows on my face but at that stage, my legs were unwilling to go any faster. With 3 Km to run, effort was now approaching maximal but the increase in pace was modest. In the final sprint, the tense neck yet floppy wrist suggest that I was not recruiting muscles very efficiently. 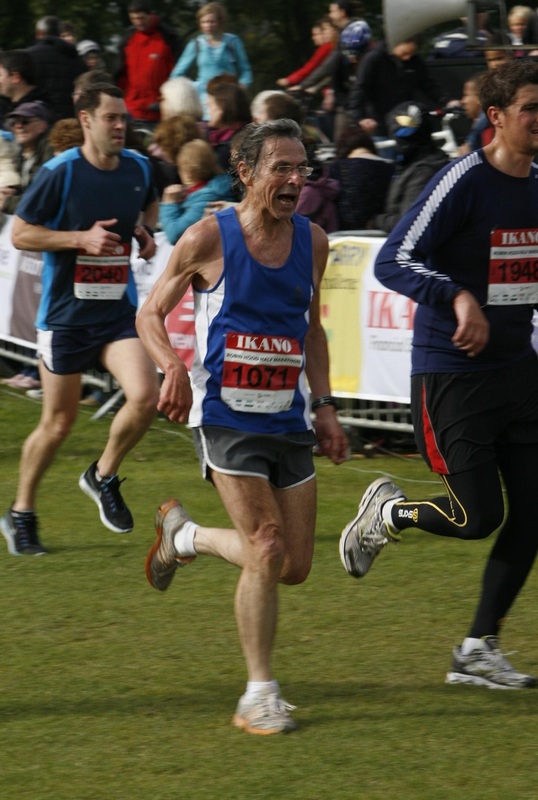 However, the facial expression might have been just right for Ewen’s fantasy Hollywood blockbuster in which an elderly professor with cronky legs pits his failing strength against the Vice Chancellor’s pretty PA in a sprint to the finish. The outcome will determine whether a legacy to the University will be spent on a new limo for the VC or on refurbishing equipment desperately needed for life-saving medical research in the prof’s lab. But in the more prosaic real world, I was in fact fairly pleased with the way I had run the race, and think I got about as much out of my legs as they were fit to give. 10 metres to go. Enough for one more scalp? For two days after the event I had moderately severe generalised DOMS but fortunately only a scarcely perceptible localised discomfort in my left calf, so I had not done any significant local damage in my sprint finish. Towards the end of the week, I did a session of Peter Magill’s skipping drills and the only noticeable muscle issue was mild tightening of my hamstrings in the final few metres of the skip and kick drill. This resolved when I slackened the vigour of the kick. So overall, the HR data and other evidence confirmed what I already knew from my experience on the day. I need to strengthen my legs, and will start on the free weight program in about two weeks, after I return from a conference in Switzerland, and a few days walking in the Bernese Oberland. I will assess gains in strength using the hopping test but the more meaningful measure will probably be my time for a 5K, by the end of the year. At the beginning of the current half-marathon campaign, I was unsure that I could even achieve a time of 25 min for a 5K and was pleased when I did a 5K parkrun in 24:45, with an average HR of 143. So my time of 23:50 with a somewhat lower heart rate for the final 5Km in the half marathon at least demonstrates that my aerobic fitness and endurance did improve substantially during the campaign, even if the improvement in power was rather modest. I doubt that I will ever run a 5K in less than 20 minutes again, but I would at least like to get down to around 22 min. Then I should aim for another half marathon in the spring and perhaps a full marathon in the autumn. This entry was posted on October 6, 2012 at 11:33 am and is filed under Races. You can follow any responses to this entry through the RSS 2.0 feed. You can leave a response, or trackback from your own site. What great photo’s, your warrior face in the final sprint is worthy of part in a battle scene in Braveheat, all was missing what a kilt and sword! It’s good to hear that you strain to your calf is healing up nicely. I only wish I could say the same about my planta fascia, got the marathon tomorrow and they are the least comfortable they’ve been for several weeks. At short notice our doctor said that all five of my family (2 parents, 3 kids) had to get the flu jab yesterday, so I suspect my immunse response has resulted in general inflamatation levels rising. Fingers crossed it’ll settle down overnight. 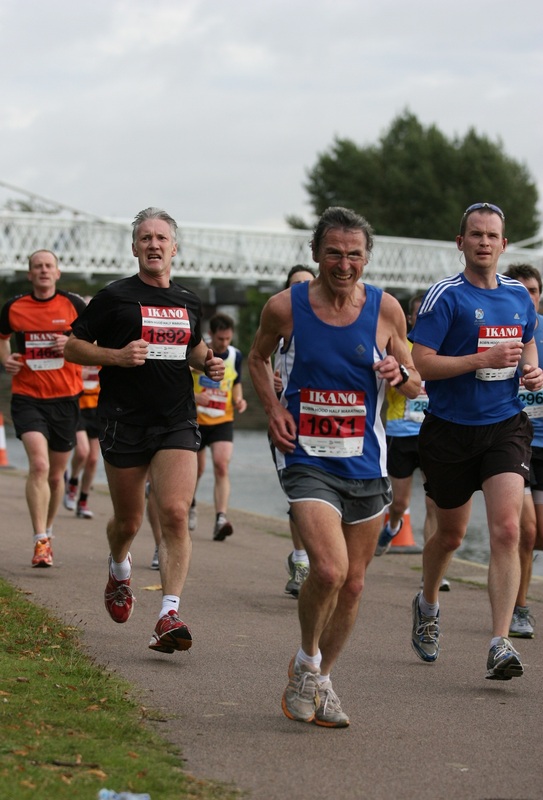 Have you had a flu jab and been training/racing afterwards? Thanks for your comment. Yes I guess I do look as if I am ready to do some damage with a claymore.. Sorry to hear that the plantar fascia are still troubling you. Thanks for your explanation of the immunse response. Last night I was aware of the aches in muscles that hadn’t ached for weeks, and today it’s only the plantar fascii that seem to be remaining more sensitive that usual. I don’t have any fever, resting HR isn’t particularily elevated so I think I’m probably safe. 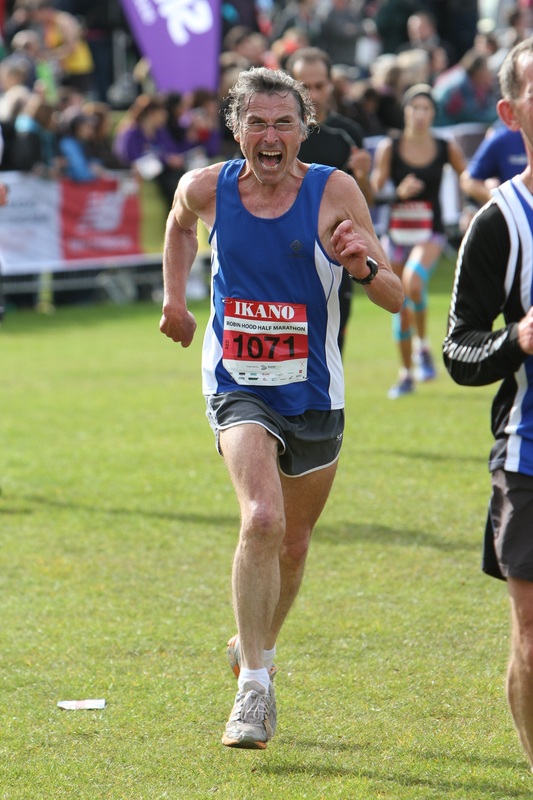 Now that is a great race face! I’m deeply envious. Canute, some great photos of you in action. I’m inclined to use ‘the final sprint’ as the theatre poster for our summer blockbuster. The HR data from the race is interesting and the conclusions you come to make sense. I’d agree that the increase in the last 5k but with higher h/beats per km would be due to a natural combination of fatigue and heat build-up. The h/beats per km for the first parkrun is 708, so your aerobic capacity/endurance has shown a great improvement. The 143 reading though, does show that there’s room for improvement if you can strengthen the legs to the point where you can push the HR higher at the end of races. I’m wondering though if leg strength/speed is always going to be the weak link for runners of all ages? My guess would be that many young elite runners wouldn’t have the leg strength to match their highly developed aerobic systems. In other words, their cardio fitness is rarely the limiting factor (to race speed) — it’s always muscular efficiency and speed. I agree that the HR data over the final 5 Km supports the speculation that there is reserve cardiac capacity to be harnessed if I can increase my muscle power. I think that a younger athlete who focuses on large training volume without any form of strength work might suffer a similar limitation. It is noteworthy that Lydiard’s protégés not only did the Sunday morning Waiatarua circuit in the Waitakere Hills but also did uphill bounding. Ed Whitlock at first appears to be the exception to the principle that muscle power is required to maximise the use of cardiac capacity, but he did a lot of intense interval sessions in late middle age, and even in old age, he does quite a lot of racing over short distances in addition to his high volume, low intensity marathon training. It is also interesting to speculate that loss of skeletal muscle bulk might make an important contribution to decrease in maximum hear rate with age. Anecdotal evidence suggests that men who continue lifting weights into late middle age do not suffer decrease in HRmax, but the evidence is thin. Yes! We should have Zooey looking over her right shoulder with her face displaying an expression of shock and horror. That’s a great point about Lydiard’s protégés – they’d be getting muscular and aerobic benefit from the long run over such a hilly course — similar to de Castella, Andrew Lloyd et al with their runs over the very hilly Stromlo courses in the 80s & 90s. I’d say that yes, Whitlock would be getting the muscular strength from regular racing (as well as having the genetics for speed going by his youthful times). 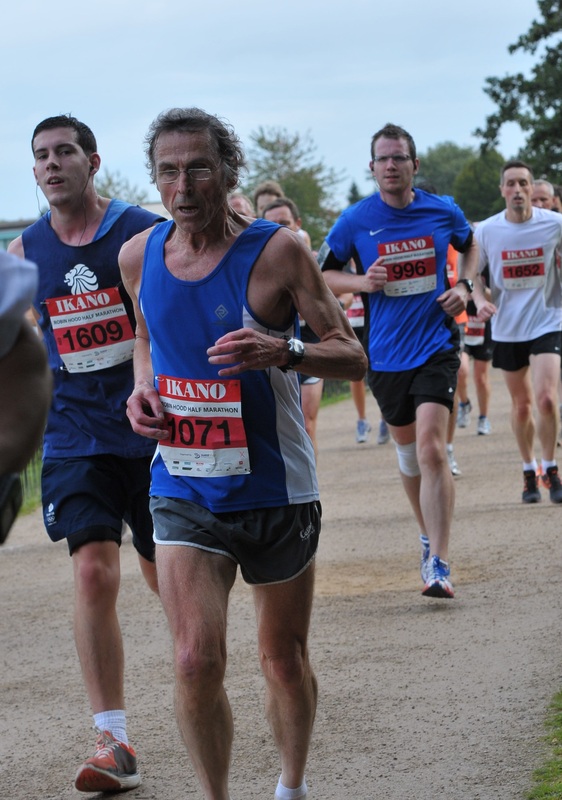 He’s just ‘good’ — ran a 1:38:59 half recently at age 81! It would be fascinating to know his HR % of max during a marathon. I’d suspect it would be unusually low. As we been discussing, there is an element of strength training in the programs of many successful endurance athletes, though you are right to imply that the only adequate way to respond to the achievements of a prodigy like Ed Whitlock is to start with the acceptance that he is exceptionally good. Nonetheless, having accepted that he is exceptional it is still useful to ask what lessons one might learn from him. Whatever one makes the benefits of his past interval sessions and his more recent track racing, the overpowering lesson from Ed Whitlock is that one should run as much as one can. However, it is clear that he builds to his massive volume of running very gradually when coming back from either injury or arthritis. The overpowering lesson from assembling all the information from all sources, is that there is no single strategy that suits everyone. For me at least, the evidence suggests that strength is the major requirement in the next phase. Canute, that is a collection of great and inspirering photo’s! I have been negleting serious strength training for a long time as well, and clearly feels that that my aerobic capicity is larger than my strength, and that this is a clear limiting factor, even as my technique has improved greatly and has been my main focus over the last few years. It’s time to build some strenght again for me me as well, even though I easily gets quite painful DOMS. I have found compression gear to be very helpful in this regard, but would appreciate your thougths on this topic. I think the evidence that compression clothing worn during the recovery period promotes better recovery is fairly strong. The mechanism is debateable. I think it minimises accumulation of inflammatory exudates in unhelpful extra-cellular locations, and thereby assists the removal of toxic waste. It is possible that a prolonged cool-down employing very low intensity exercise (preferably with minimal eccentric load on the muscles) might be equally effective, and is likely to cost less money but more time than wearing compression clothing. I am curious about how much HR differs between individuals when running races, and how over time this changes, and what it might mean for intrpreting fitness. My average HR during the Kielder Marathon was 169, on the few flats my pace was around the same as your half marathon performance. If I was running just a half marathon at this pace my HR would be lower for sure, but no where near to your HR in the 140’s. As a % of max HR it may well be similar, what do you think your max HR might be? I believe might is probably over 190, so I did the marathon around 88% Max HR. Percentages don’t tell all the story though – for whatever reason your heart is able to pump more blood than my per beat despite me being at a guess around twenty younger. No doubt my legs are stronger, my Max HR higher, but it would seem that you must have a larger physical heart to be able to pump more blood per beat. All muscles on our bodies are trainable but one would expect them to training in a similar way – as your legs get stronger, you get faster and the load on your heart gets greater so it adapts as well. Relative to you iIt would seem that my legs have adapted more than my heart. Does age make a difference to what parts of the body atrophy vs build up? I’ve often seen discussion of a high HR during exercise as an indication of poor areobic fitness, and for me I have a relatively hight HR when running easy, at a 140bpm HR equates to around 9min/mile pace when on the flat. I can’t run at steady state with a HR below 130. However, I can run comfortable with a HR in the 150’s all day long (my 12hr:46 time for the Fling my HR was 152) – so I’m pretty sure that I’m still running areobic at this HR. I’d guess I’m still largely areobic into the 160’s, with my looking at tempo runs my Lactate Threshold is up around 175. I mention this as if I went my Maffetone’s as a guide I’d should be targetting a HR of less than 140 for my base aerobic work. Other HR based training plans would bring in around the same level. Yet for me it would seem way out looking at other factors like my very easy breathing and just how long I can sustain higher HR’s. As an athlete I’ve always considered myself one with almost all slow twitch fibres. I’m terrible at sprinting and have always performed better at long distances. This lead to be over the past assume that I’d be one with a good ability for areobic strength rather a weakness if one did go along with HR training tables. I do wonder if perhaps that I do indeed have predominately slow twitch fibres and compared to the average member of the population burn more fat and less carbs for a given speed, and burning more fat requires more oxygen than just buring carbs, so… might this just require a relatively higher HR to deliver that Oxygen to the muscles? Following this line of reasoning further might this also explain why I can achieve a higher % of max HR when doing edurance events? So rather my high HR suggesting poor aerobic fitness but perhaps a natural propencity for good areobic fitness? As another datapoint, Thomas has a similarily high HR during races and I’m pretty darn sure that he has a stella areobic fitness. I am curious on your thoughts about this, and also how you feel you fit in with your own experience. I am also curious what your thoughts on the validity of various HR training zones/intepretations. As you imply. the volume of oxygen delivered to the tissues of the body is the product (ventricular stroke volume) x HR x (A -V)O2, where (A-V)O2 is the difference in oxygen content of arterial and venous blood. We can minimise the amount of oxygen required to maintain a given pace by improving mechanical efficiency; decreasing body mass and developing the capacity to utilise a higher proportion of fat to glucose, but if we assume these factors have been optimised, the volume of oxygen required for a given pace is fixed. So the question is what is the most efficient way for the heart to deliver the required oxygen. Normally the lungs are capable of topping up a large (A-V)O2 difference so cardiac load can be minimised by maximising (A-V)O2 difference. We do this by increasing muscle capillary density and mitochondrial enzyme capacity. The first major benefit of aerobic training is increasing capillary density and mitochondrial enzymes, as this decreases the demand on the heart . If we assume that two athletes each achieved similar development of capillaries and mitochondrial enzymes, to achieve similar performance they achieve a similar value of the product ventricular stroke volume x HR. The larger the stroke volume the lower the HR. The question is what is the optimum combination of stroke volume and HR. I do not know the answer but my own speculation is based on the fact that there are two main ways in which we can increase the force of contraction of the heart: stretching priori to shortening, and increasing adrenalin. With a large stroke volume and low HR the long period available between contractions allows complete filling, thereby stretching the cardiac muscle prior to contraction and making the contraction more powerful. For an older athlete with relative weak adrenergic drive, it is best for the heart to operate at a relatively low HR and high stroke volume, thereby maximising the benefit of the pre-contraction stretching of the fibres. Adrenalin exerts increase both the strength of contraction and the HR. For a younger athlete, whose heart is more responsive to adrenalin, it is possible to achieve the required cardiac output by use of adrenalin to increase both HR and the strength of contraction without such strong reliance on a long filling time to stretch the cardiac muscle. It is also likely that even without extra response to adrenalin the younger athlete’s heart would be stronger and therefore less dependent on a long filling time. So I consider that my low HR is an effective adaptation for me, but for a younger athlete, similar cardiac output can be achieved a higher HR. We have been discussing the optimum way of achieving partial speed. If we address the question of what is the way that we can maximise the pace that can be achieved aerobically, the goal is then to be able to increase the product of stroke volume and HR. Stroke volume can be increased by training. Unfortunately I am probably already nearly at the maximum I can achieve, whereas a younger athlete who currently achieves a similar cardiac output by virtue of higher HR and lower stroke volume, has a greater capacity for improvement. I face the challenge of whether or not I can increase either the intrinsic strength of cardiac muscle and/or increase adrenaline output. There are other possibilities for at least moderate improvement such as improving the capacity of my muscles to use a higher proportion of fat to glucose thereby decreasing oxygen demand, and also improving ability to clear acidity as I approach the anaerobic threshold. But in the final analysis, I believe that my low HR suggest that I have nearly maximised the possible gains from increasing stroke volume, and it would be desirable to have the capacity to generate a higher HR – or at least, to prevent further decrease in HR max. I think you should celebrate your capacity to generate a higher HR. With regard to the use of different HR zones in training, overall, a distance runner needs to optimise capillary density, mitochondrial enzymes, ability to utilise fats, ability to clear acidity and also stroke volume, I believe that training across a variety of zones is the best way to optimise all of these variables. Canute, that makes for interesting reading. 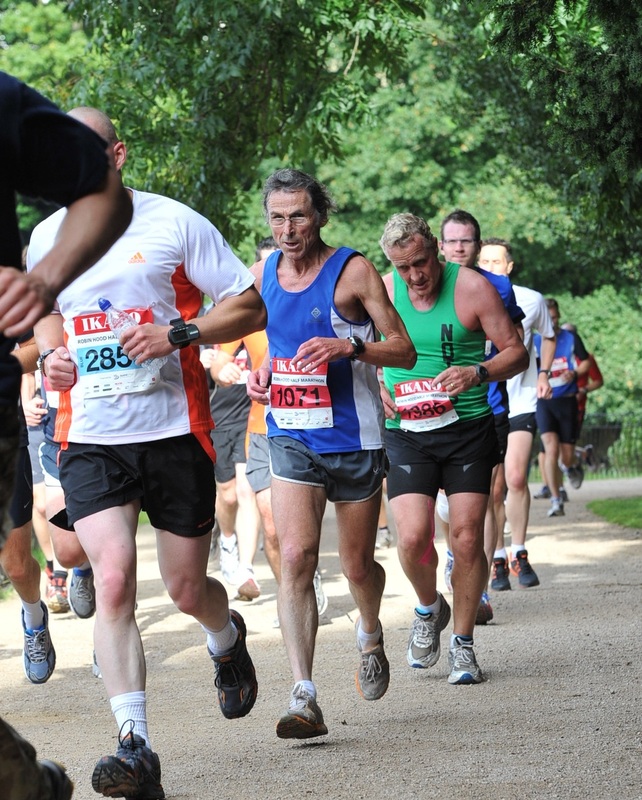 As I’ve been running pretty much continuously since my mid-20s I know that maximum HR does decline with age. In my mid-30s I could race a 10k with an average HR of around 170, now in my mid-50s my ave HR is mid to high 140s for a 10k. I’m curious about the effects of adrenaline and does that decline with age? Would more rest days prior to a race help with adrenaline production? What training strategies are best to minimise loss of maximum HR? I know in my 40s when I was running many interval sessions I could always attain a maximum HR during these. Now I can’t, but maybe that’s because I’m tired?! I know individual maximum HR varies. I know a mid-50s female runner who has a relatively high maximum in the 180s but she is short and light (and runs lots of interval sessions). Do small people (esp small females) generally have a higher maximum HR? While adrenalin production probably does decrease with age, perhaps even more important is the fact that the ability of the heart to respond to adrenalin decreases with age. Hormones such as adrenalin must bind to specific receptors on the surface of heart muscle cells to produce their effect. In older people, the number of receptors for adrenalin decreases. In general, receptor numbers tend to increase if there is less chronic elevation of adrenalin, so I suspect that avoiding unnecessary chronic stress and thereby maintaining a lower baseline of adrenalin probably leads to improved response to the surge of adrenalin when required for activities such as running. I believe that the type of training does affect ability to achieve a high HR. A large amount of low aerobic training tends to improve leg muscle capillaries and mitochondrial enzymes, thereby enabling the leg muscles to extract a higher proportion of oxygen from blood, so (A-V)O2 is increased. Therefore, at a given work load, a lower HR is sufficient to deliver the required oxygen. This is generally regarded as a good adaptation to training, but one must work harder to get HR up to levels near HRmax. In contrast, higher intensity training produces a relatively greater improvement in cardiac output than in (A-V)O2 so it is easier to get to high HR. Of course the easiest way to create a situation in which you can get to high HR is to run after doing no training for 6 months. Because (A-V)O2 deteriorates during de-training, the heart is forced to beat faster to achieve even a moderate pace – but this does not lead to PB’s. The athlete’s goal is to have the capacity to increase HR even when (A-V)O2 and stroke volume are high. One thing that is definitely achievable is increasing the ability to clear acidity from the blood as this facilitates aerobic metabolism and delays onset of anaerobic metabolism as work-rate increases. Training at or near anaerobic threshold is probably the most effective way to achieve this. Therefore intervals (especially HIIT) or fast tempo runs make it easier to achieve higher HR by raising the anaerobic threshold, but this does not necessarily increase HRmax. Thanks Canute. I have experience of a higher HR being more easily attained after detraining (or many days off) – in Aug 2010 I’d been sick and had 5 days off. My first run back was an ‘easy’ interval session (5 min k pace) during which my highest HR was 162 (with a sprint on the last interval). At the time it surprised me how easy it was to attain that HR. Interesting about the ways to increase the ability of the heart to respond to adrenaline. On that, isn’t growth hormone released during sleep? So more hours of sleep might help in that regard? I know Paula Radcliffe & other elite runners sleep for 10+ hours a day. The elite Kenyans are well known for napping and just lying around between their training sessions. Seeking ways to reduce stress at work will help too! Thanks for your comment. The most rapid change when you stop training is a decrease in blood volume . I suspect this is what happened during your 5 days of illness. When blood volume is less, the filling of the heart prior to contraction is less so stroke volume decreases. Therefore HR must increase to achieve the same cardiac output, but the effort is not appreciably greater because the work done by the heart is similar. Yes, sleep promotes HGH release so getting enough sleep (over a sustained period of weeks or months during heavy training) and also avoiding chronic stress are important if you want to achieve peak performance. Unfortunately, for the non-professional runner who has a demanding job this is not easy. I nonetheless think it is useful to acquire the knack of reducing muscle tension as much as possible even during a busy working day. With regard to the sub-1:40 HM challenge, I was pleased to do a 5K parkrun in 22:19 this morning without pushing too hard, so I hope a sub-22 5K is within reach and therefore the 1:40 HM target appears feasible. Thanks for the really informative replies to myself and Ewen. Are the equations that it provides wrong/oversimplified? My interpretation of these equations is that carbs would take 6xO2 melocules to create 38ATP, while fatty acid would take 23xO2 to create 129ATP, so the ATP/O2 ratios would be 6.33 and 5.61 respectively. If this is appropriate then to get a given amount of ATP using Fatty acids would require roughly 13% more oxygen. I assumed this was one of the reasons for heart rate drift that we see as we move from burning carbs to more fats during longer bouts of exercises. I am missing something here? You are correct, at least for short and medium distances. As you point out, it requires approximately 13 % more oxygen to produce a molecule of ATP from fat than from glucose. I was thinking of long distance running, though my logic is convoluted. We agree that HR increases as glucose supply runs out. I have hitherto assumed that this is mainly due to the extra adrenalin produced as glucose level falls. The best way to delay the exhaustion of glucose is to utilise fats. If a high glucose level is sustained for longer, HR will not rise as much. However, this logic depends on the question of the mechanism of HR drift and this is a controversial issue. There is a consensus that increase in body temperature contributes to HR drift, but the role of other factors is less clear. While I believe the increase in adrenalin is another, I accept your point that any increase in ratio of fat to glucose utilization will also tend to cause an increase in HR due to the 13% larger amount of oxygen required to produce each molecule of ATP. However, I am still inclined to believe that adrenalin increase is likely to be the larger effect, and therefore sparing glucose by utilization of fat is likely to lead to a lower HR drift, but I cannot provide convincing evidence for this. Whatever the mechanism of HR drift, a large volume of low aerobic training does decrease HR drift but factors other than conservation of glucose probably contribute to this; especially the improvement in ability to extract oxygen for arterial blood due to increases capillary density. Canute, yes, thanks for your detailed replies — most informative. Briefly on HR drift, my experience is that I only suffer from it when running ‘long’ in hot weather (if not acclimated to those temps) so I’m presuming dehydration is a factor. In temps below 20C I rarely experience it (although I’m not running much longer than 2 hours these days). Congrats on your 22:19! I’d be there with Zoe racing you in a 5k at the moment. Thanks. You draw attention to an additional feature of the mechanism of HR drift. Not only does an increase in body temperature lead directly to increased HR, but dehydration might result in decreased blood volume leading to decreased filling of the heart, decreased stroke volume and therefore an increase in HR in order to maintain the cardiac output.